We export Marine ship cables to Afghanistan, Albania, Algeria, American Samoa, Andorra, Angola, Anguilla , Argentina, Armenia, Aruba, Australia, Austria, Azerbaijan, Bahamas, Bahrain, Bangladesh, Barbados, Belarus, Belgium, Belize, Benin, Bermuda, Bhutan, Bolivia, Bosnia-Herzegovina, Botswana, Bouvet Island, Brazil, Brunei, Bulgaria, Burkina Faso, Burundi, Cambodia, Cameroon, Canada, Cape Verde, Cayman Islands, Central African Republic, Chad, Christmas Island, Cocos (Keeling) Islands, Colombia, Comoros, Congo, Congo, Costa Rica, Croatia, Cuba, Cyprus, Czech Republic, Denmark, Djibouti, Dominica, Dominican Republic, Ecuador, Egypt, El Salvador, Equatorial Guinea, Eritrea, Estonia, Ethiopia, Falkland Islands, Faroe Islands, Fiji, Finland, France, French Guiana, Gabon, Gambia, Georgia, Germany, Ghana, Gibraltar, Greece, Greenland, Grenada, Guadeloupe (French), Guam (USA), Guatemala, Guinea, Guinea Bissau, Guyana, Haiti, Holy See, Honduras, Hong Kong, Hungary, Iceland, India, Indonesia, Iran, Iraq, Ireland, Israel, Italy, Ivory Coast (Cote D`Ivoire), Jamaica, Japan, Jordan, Kazakhstan, Kenya, Kiribati, Kuwait, Kyrgyzstan, Laos, Latvia, Lebanon, Lesotho, Liberia, Libya, Liechtenstein, Lithuania, Luxembourg, Macau, Macedonia, Madagascar, Malawi, Malaysia, Maldives, Mali, Malta, Marshall Islands, Martinique (French), Mauritania, Mauritius, Mayotte, Mexico, Micronesia, Moldova, Monaco, Mongolia, Montenegro, Montserrat, Morocco, Mozambique, Myanmar, Namibia, Nauru, Nepal, Netherlands, Netherlands Antilles, New Caledonia (French), New Zealand, Nicaragua, Niger, Nigeria, Niue, Norfolk Island, North Korea, Northern Mariana Islands, Norway, Oman, Pakistan, Palau, Panama, Papua New Guinea, Paraguay, Peru, Philippines, Pitcairn Island, Poland, Polynesia (French), Portugal, Puerto Rico, Qatar, Russia, Rwanda, Saint Helena, Saint Kitts and Nevis, Saint Lucia, Saint Pierre and Miquelon, Samoa, San Marino, Saudi Arabia, Senegal, Serbia, Seychelles, Singapore, Slovakia, Slovenia, Solomon Islands, Somalia, South Africa , Taiwan, Tajikistan, Tanzania, Thailand, Togo, Tonga, Tunisia, Turkey, Turkmenistan, Tuvalu, Taiwan, Turkey, Vanuatu, Venezuela, Vietnam, Yemen, Zambia & Zimbawe. 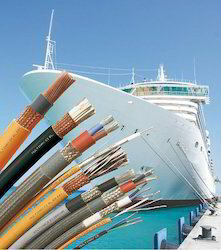 Our firm specializes in providing a quality array of Marine Cables. Using superior quality of raw materials and advance technologies we manufacture these products. These are used for different types of cable construction. Our team of professional experts supervises the manufacturing process of these cables Moreover these are tested on certain parameters before the delivery of the placed order to ensure product quality. For the purpose of providing clients with maximum satisfaction, we manufacture these Auto Marine Cables using raw materials of the highest grade and modern machines. Known for their high resistance to water and moisture, the product with its utmost efficiency prevents short-circuits. The safety and efficiency they provide are highly praised in the market. In addition, we offer these cables to clients at a price which is highly reasonable. Bhuwal Cables Marine ship cables holds its vital role in specific application where high flexibility and comparatively high temperature is required. Rubber insulation also permits simple splices and terminations. Sythetic rubber such as butyle rubber, Etnylene Propylene rubber, Poly Chloroprene rubber, Chlorosulphunated polyethylene rubber have better heat resistance, oil resistance and resistance against influence as compared to natural rubber. Out of all the synthetic rubber, silicon rubber has excellent die-electric characteristics. 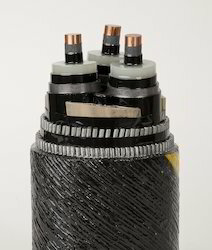 It is possible to operate silicon rubber insulated cables at ambient temperature of upto 180oC continuously. The polychloroprene rubber, chlorosulphonatated, nitrille sheating are formulated against high abrasion, oil, weather and fire resistance properties. EPR insulation with CSP sheathing can withstand high ambient condition having long durable ageing properties. Marine Electrical Cables comprises sheathing compounds such as NBR & HOFR that provides high temperature resistance and abrasion resistance attributes to these cables. We also supply communication cables and signaling cables as per customer requirements.